The second of four Navratri, the one which takes place after Holi, Chaitra Navratri 2019 will begin with Ghatasthapana Puja on April 6 (Saturday), and conclude with Rama Navami celebrations on April 14 (Sunday). The word Navratri or Navaratri translates to ‘Nine Nights,’ is dedicated to worshipping Goddess Durga and her nine manifestations, known as Navdurga (also spelt as Navadurga). Chaitra Navratri also marks the birthday of Lord Rama, which is celebrated as Rama Navami. Apart from Durga and Rama, the nine-day festival is dedicated to other gods and goddesses such as Saraswati, Lakshmi, Ganesha, Kartikeya, Shiva and Krishna region wise. April 2019 Festivals, Events and Holiday Calendar: Chaitra Navratri to Gudi Padwa to Rama Navami, Know All Important Dates and List of Hindu Fasts for the Month. Chaitra Navratri is also referred to as Vasanta Navratri as it is observed in the springtime, in the lunar month of Chaitra, which is the first month of the year according to Hindu Calendar. It corresponds to March-April as per Gregorian Calendar. In this article, we will be looking at the significance of nine days from Pratipada to Navratri Parana, shubh muhurat time and date-wise reverence of the nine forms of Maa Durga (Goddess Parvati) – Goddess Shailaputri, Goddess Brahmacharini, Goddess Chandraghanta, Goddess Kushmanda, Goddess Skandamata, Goddess Katyayani, Goddess Kaalratri, Goddess Mahagauri and Goddess Siddhidhatri. We will also look at other festivals (mostly region-specific) that fall during the nine-day festival of Chaitra Navratri. Chaitra Navratri 2019: O Sheronwali And Other Bollywood Songs on Maa Durga You Can Play on The Auspicious Occasion. The first day of Chaitra Navratri is called pratipada or Prathama. One of the most important rituals, which takes place on this day is Ghatasthapana Puja. Ghatasthapana also known as Kalash Sthapana marks the beginning of Navratri as devotees invocate Goddess Durga to reside in their household during Navratri. It is very important to perform Ghatasthapana keeping shubh muhurat (auspicious timing) in mind. 2019 Chaitra Navratri Ghatasthapana Shubh Muhurat is 05:39 to 09:47 on April 6, a duration four hours and seven minutes. After Ghatasthapana, devotees perform Shailputri Puja in honour of Goddess Durga’s first avatar – Maa Shailputri. She is the daughter of mountains and governs Moon. On April 6, Chandra Darshan will also take place. It is the first day of moon sighting after no moon day also known as Amavasya. Devotees observing day-long fast, break it after seeing the new moon on that night. The second day of Chaitra Navratri 2019 falls on April 7, Sunday. We will be worshipping Goddess Brahmacharini on this day. She is the unmarried, celibate form of Goddess Durga. Devi Brahmacharini is the goddess of asceticism and penance and governs the planet Mars. Sindhara Dooj, a significant festival for women also falls on Dwitiya (second day) of the auspicious Navratri festival. Though it is prominently celebrated during Ashada Navaratri and Sharada Navaratri. The third day of Chaitra Navratri 2019 falls on April 8, Monday. On Tritiya (third day), Maa Chandraghanta will be worshipped. She is the third avatar of Durga, and her married form and governs the planet Venus. Apart from Chandraghanta Puja, the day will also see a celebration of Gangaur or Gauri Tritiya or Gauri Puja in the northern states of Rajasthan some parts of Uttar Pradesh, Madhya Pradesh, Haryana and Gujarat. Women celebrate this colourful festival for marital bliss. It is done in honour of Maa Gauri and Lord Shiva. Drik Panchang also states Saubhagya Teej to be observed with married women keeping Saubhagya Sundari Vrat on the day. The fourth day of Chaitra Navratri 2019 falls on April 9, Tuesday. Devotees will pray to Devi Kushmanda, the fourth form of Devi Durga. According to the Hindu texts, she created the universe with a flash of her smile and also governs the Sun. On Chaturthi (fourth day), and as per the Hindu scriptures Chaturthi Tithi(s) belong to Lord Ganesha. While every lunar month has two Chaturthi dates, the one during Navratri holds much religious significance. The day will also witness another major festivity, Lakshmi Panchami - dedicated to the Goddess of Wealth, Prosperity and Abundance – Maa Lakshmi. The fifth day of Chaitra Navratri 2019 falls on April 10, Wednesday. On Panchami (fifth day), we will be worshipping Devi Skandamata, the fifth form of Goddess Durga. She governs the planet Mangal (Mercury). Skandamata is the mother of the war god Skanda also known as Kartikeya, Murugan or Subramanya. This day is also celebrated as Skanda Sashti, especially by Tamil Hindus. Drik Panchang also states Naag Puja to be observed on this day. This sixth day of Chaitra Navratri 2019 falls on April 11, Thursday. On Shashthi (sixth day), devotees will perform Katyayani Puja to please the sixth avatar of Devi Duga. Katyayani who rules Brihaspati (planet Jupiter) is known for her anger, vengeance and power. But if you pray to Maa Katyayani with a pure heart, she is known to bless devotees with desired boons. April 11 will also see celebration of Yamuna Chhath Puja or Yamuna Jayanti. It marks the day when Goddess Yamuna descended on the Earth and is celebrated with much pomp and gaiety in the city of Mathura. The seventh day of Chaitra Navratri 2019 falls on April 12, Friday. On Saptami (seventh day), devotees will observe Kalrtri Puja, dedicated to the seventh avatar of Goddess Durga. Kalratri is the fiercest and most ferocious form of Maa Shakti who slayed demons Sumbha and Nisumbha. She governs Shani (planet Saturn) and is called death of time as she is great than time itself. The day will also witness Maha Saptami celebrations, though they are not as grand as the one during Sharada Navratri. The eighth day of Chaitra Navratri 2019 falls on April 13, Saturday. There are a number of festivals to be observed on this day, though they are more significant during Sharada Navratri. However, the day will begin with Mahagauri Puja. Devi Mahagauri is eighth form of Goddess Durga. She is the epitome of purity and achievements, provides knowledge, removes all sins and mistakes of a person. Mahagauri governs Rahu. The ninth and last day of Chaitra Navratri falls on April 14, Sunday. Durga devotees will worship her ninth form, Siddhidatri who appeared from the left half of Lord Shiva. She removes ignorance from her devotees and governs Ketu. After Shiddhidatri Puja, devotees will conduct Chaitra Navratri Parana when Navami Tithi is over and Dashami Tithi prevails. Parana means breaking of the nine-day long fast according to Nirnaya-Sindhu. Navami is an important day of the nine-day festival as it also marks the birth anniversary of Lord Rama known as Rama Navami. Now, there are two dates mentioned for Rama Navami. 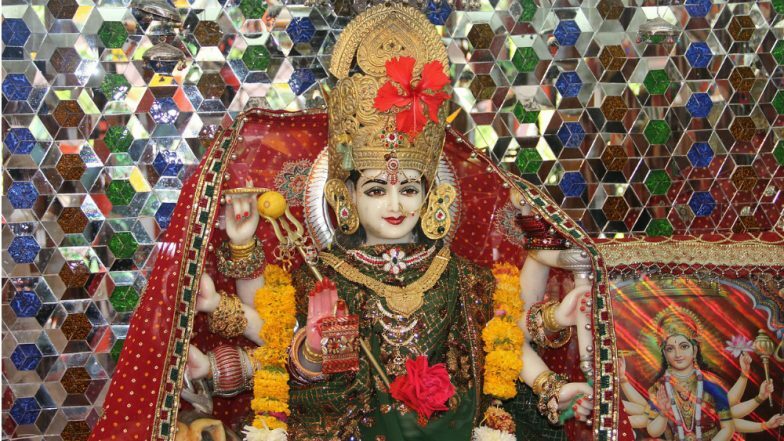 According to Drik Panchang, Rama Navami 2019 is observed on April 13 (Saturday) and Rama Navami Puja Muhurta = 10:33 to 13:04 (Duration = 2 Hours 30 Mins). Meanwhile, Vaishnava Rama Navami falls on April 14, 2019 (Sunday). Rama Navami is celebrated with a lot of fun and fervour at Ayodhya, the birthplace of Lord Rama. People travel to this northern region to witness the grand celebrations of Rama Navami. Devotees look forward to fasting all day from sunrise to sunset as Eight Prahar fasting is suggested on the day. We wish all our readers a very Happy Chaitra Navratri 2019 and all related festivals falling during the nine-day period in advance.